Mali is an African nation with a population of nearly 15 million people. The Malian economy is based on agriculture and the majority of the population live in rural areas and are engaged in subsistence farming activities. Agricultural activities occupy approximately 70% of Mali's labor force and provide 42% of GDP. Approximately half of the population lives on less than $1.25 a day. Mali also possesses significant gold mineral reserves and is Africa's 3rd largest gold producer. In Mali, about 27% of the population is food insecure and poverty incidence remains high at 47.5% (in 2006). Empirical results show that a 25% increase in food prices in 2008 led to an increase in poverty by 1.7%, equivalent to nearly 300,000 additional people falling into poverty. 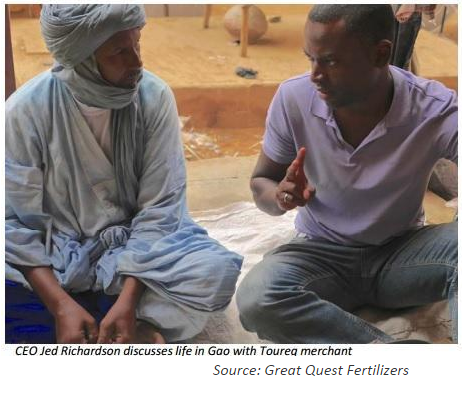 With its agricultural regions located along the Niger River, a domestic source of natural phosphate rock would offer a spectacularly economical fertilizer, help improve food security and alleviate poverty, and create a potential export product. The country's recent history has been challenged by violence and political instability, however, thanks to the signing of a peace deal in June 2015, the country can take advantage of a dynamic regional economic hub. With a GDP growth of 7.2% in 2014, Mali is on the road of progress. In January 2012 a rebellion began in northern Mali. The rebellion was a follow on effect from the destabilization of Libya. The highest ranking officials in the Libyan armed forces were Tuareg and other nationals, and when Muammar Qaddafi was removed from power, they were scattered and left the country. Mali was a weak spot and this is where the old guard first appeared and incited the rebellion. Initially, the goal of the rebellion was to separate the north from Mali, however, Al-Qaeda soon appeared and started to exercise their own influence in the region. Eventually there was international intervention and the rebellion was quashed. The Tuareg's played a pivotal part in removing the Al-Qaeda influence within the region and now only small pockets of Islamic fundamentalists remain. On the 20th of June 2015, an alliance of Tuareg rebels and the government of Mali signed a peace deal, giving more autonomy to the sparsely populated north and underlined a joint effort to rid the region of Islamist militants. The deal is being monitored by the international community, including France. In 1991, following the lead of the International Development Association, Mali relaxed the enforcement of mining codes which led to greater foreign investment in the mining industry. From 1994 to 2007, national and foreign companies were granted around 150 operating licences along with more than 25 certificates for exploitation and more than 200 research permits. Gold mining in Mali has increased dramatically, with more than 50 tonnes in 2007 from less than half a tonne produced annually at the end of the 1980s. Mining revenue totaled some 300 billion CFA francs in 2007 (US$ 563 million equivalent) more than a thirty times increase from the 1995 total national mining revenue of less than 10 billion CFA. Government revenues from mining contracts, less than 1% of the state income in 1989 were almost 18% in 2007. Mining friendly Mali has attracted large private investments including Anglogold-Ashanti ($250 million) in Sadiola and Yatela, and Randgold Resources ($140 million) in Morila. Other miners, including Endeavour, Anglogold, Iamgold and Randgold, have operations in the country. Mali is developing its cotton and iron ore extraction industries to diversify its revenue sources. Furthermore this West African nation has abundant mineral wealth in bauxite, uranium, diamond, base metals and phosphate deposits. Mali is building a road network that will connect it to all adjacent countries and it has an existing railway line to Senegal.